Netflix doesn’t think Disney+ will have a “material” impact on its fortunes. Neither is it willing to emulate Disney’s successful Indian service Hotstar to achieve success. Both positions could be big mistakes for the company. Netflix gained 1.74M (million) paid customers (1.24M free-trialers) in the US in the first quarter to reach 60.2M paid and 61.8M total streamers. Outside of the US, the company gained 7.9M paid and 5.7M free-trialers to reach 88.7M paid and 93.6M total streamers. Netflix beat its estimated gain for the quarter of 8.9M paid by 0.7M. Revenue also grew an impressive 26% over Q1 2018, to reach $4.52B (billion). The growth in revenue is higher than the growth in subscribers (24%) because of the price increases the company rolled out across many of its markets. US growth could hit a speed bump when Disney+ is released later this year. As well, the spectacular International growth will be hard to maintain if Netflix can’t improve in markets like India. However, the company doesn’t see it that way at all! What we know about Apple TV+ suggests its impact in the fourth quarter will be muted at best. Disney+ is another matter. It has a significant potential to impact Netflix growth in Q4/Q1. In Q4 2018 and Q1 2019, Netflix gained 3.2M paid subscribers in the US. The 3M or so that could potentially join later this year and early next will be bombarded by Disney+ advertising. The service will offer name-brand movies and TV shows at a price considerably lower than Netflix. Likely, many new streaming consumers will try Disney+ first, before Netflix. They may be satisfied with the content selection, at least in the short-term. Make no mistake, after subscribing to Disney+ consumers will hesitate over dipping into their pocket again for Netflix. Netflix is starting to make a big push in India, where it is at best in fourth place in the streaming market. It is very far behind the market leader Hotstar, which provides both free and subscription content and is optimized for the mobile viewer. Ironically, Hotstar is now owned by Disney since its acquisition of Fox. Disney says that Hotstar has 300M active monthly users (free and paying customers) and Counterpoint estimated at the end of 2017 the service had 75M subscribers paying $3 per month. Netflix has a long way to go to catch up. It has produced several successful Indian shows, including Love per Square Foot, Delhi Crime, and Sacred Games. Ted Sarandos, Chief Content Officer for Netflix, says the company is producing “a dozen” Indian movies. 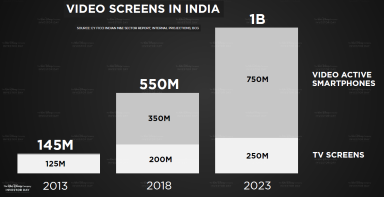 However, there are over half a billion video screens in Indian, and two-thirds are smartphones. Longer movies might not be a good fit for most of the audience. Netflix can test models all it wants. Hotstar has shown the road to success in India. It requires a much lower price and a mobile-first orientation. At least for now, it doesn’t sound like Netflix is ready to do the same.